The beginning of a year signals many things but in many community associations, it signifies the start of a new relationship with recently elected board members. Volunteering to serve your community in the capacity of an elected board member is exciting but it can also be a bit intimidating. The new responsibility can feel like a heavy weight on your shoulders or lead to a feeling of being stranded and alone in your crusade to make your community a better place. Luckily, if your community is managed by a community management company, you are fortunate enough to be surrounded by a network of seasoned professionals that will support and guide you through comprehensive orientation training. Reading Governing Documents - The initial orientation includes learning about the governing documents for the community that you serve. This means lots of reading to get familiar with articles, bylaws, CC&Rs, rules, policies and resolutions. After you’ve read all that, you’ll also need to go over past meeting minutes to become acclimated with the current business affairs of the association. But even after you’ve completed this step, your training isn’t over. As you continue to serve as a board member, in addition to the basics above, you’ll also need to learn about new challenges that will come up for your community along the way. Continuing Your Education – Community management professionals often provide continuing education, customizing educational seminars on industry hot topics, such as legislative changes, to keep board members informed. 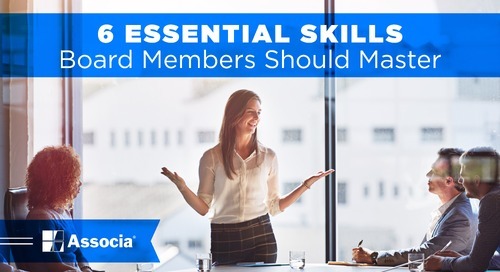 Because your membership elected you to represent their interests, it’s important to take advantage of this free training often and empower yourself to be the best board member you can be. The end goal is to educate board members with tools to assist them in making decisions for their communities from an informed perspective. Those decisions made at meetings affect the entire community so it’s crucial that every board member is equipped to lead their community responsibly and effectively. Educational opportunities are the key for making this happen, and getting into the habit of learning as a new board member will set you up to become more and more knowledgeable the longer you serve your community. Dawn Osterode, CMCA®, AMS®, PCAM® is a Nevada homeowners association industry veteran since 2002, holding multiple licenses and certifications as a Nevada reserve study specialist and licensed Nevada supervising community manager. She also specializes in developer services and providing reserve study services through Associa Reserve Studies Nevada. As an industry article contributor and educator, Dawn mentors others in providing great client satisfaction and retention.